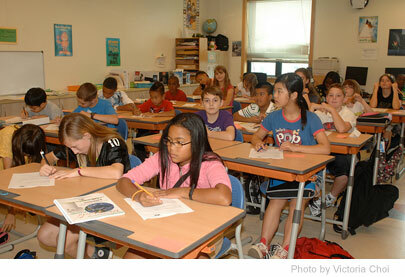 Unlike an elementary school setting, a middle school setting will offer your child several classes split up by subject. Each class will have a specific, allotted amount of time, and your student will be responsible for getting themselves from class to class on time. This is very different from an elementary school setting, where nearly every subject is taught in the same room. Many middle schools offer a variety of extracurricular activities before and after school. These activities can range from dance teams and student government organizations, to academic decathlons and special music groups. Encourage your child to take advantage of these opportunities while they are in middle school, as this could lead into more interests in high school and beyond. Your child will be responsible for each subject they learn in middle school. That is, each subject will assign its own homework, and this type of workload may be difficult for your child to adjust to. Help them understand what it means to organize their time and prioritize their tasks so that they can manage their schoolwork efficiently. In elementary school, children are separated by class and had minimal interaction with people outside of their classrooms. Middle school contrasts greatly from this setting, as there is more variety and more social interaction with peers. Talk with your child so that they understand this change in the social dynamic. Guide your child as he or she learns and grows, and experiences new environments. Though the changes may be particularly impactful at times, it is important to always remain supportive and encouraging as they grow.